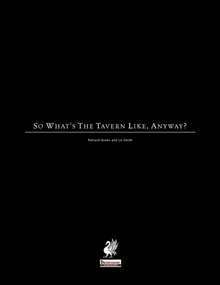 Raging Swan Press So What's The Tavern Like, Anyway? So What's The Tavern Like, Anyway? Once again, your PCs have emerged from the dungeon ready to celebrate their victory or raise tankards to their fallen comrades. Returning to town they ask “So what’s the tavern like, anyway?” At that point, likely or not the GM glosses over the tavern or wildly improvises! Unsurprisingly, PCs spend a lot of their time between adventures relaxing in taverns and inns, but often such locales end up being drab, one-dimensional affairs with no real characteristics or flavour of their own. So What’s The Tavern Like, Anyway? banishes this problem by presenting dozens of tables covering the tavern’s offering, customers and staff along with extensive notes on games of chance, drinking songs and more! This title was added to our catalog on July 26, 2012.